The song takes me back to 1980 when I was the Administrative Supervisor of the US Census (if you can imagine that) in Worcester, Mass., and I kept a radio going in my end of the enormous factory floor that was our headquarters. "Train in Vain" played every morning on the local community radio station WCUW. And every morning Jeff Bahr called in a request for "My Way," by Sid Vicious. One of my staff, Igdalia, who faced me at her desk, was amused by me and my constant muttering, and told me often, "John, you talk alone." Saw Leonard Cohen last night--an amazing three-hour show. Can't get photos, but after many tries maybe a video of Slim Gaillard. Like Louie Prima, he makes you happy when you're screwing with your computer. Guitar legend Les Paul has died. 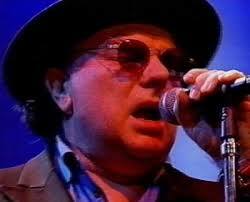 Van Morrison talks with Don Imus. For your listening pleasure. Ry Cooder on electric bottleneck mandolin. david kirby . . .
. . . writes about rock 'n' roll and race. And calls Alan Price a genius--something I've believed since "House of the Rising Son." [youtube=http://www.youtube.com/watch?v=L5YoLjYD8QE]U. Utah Phillips has died. My friend Frances Friedman had told me about Phillips when he came to meetings of the San Francisco Folk Club back in the Sixties. And then I got a chance to see him perform at Prospect House, a neighborhood center in the Laurel-Clayton neighborhood of Worcester in about 1973 or so. There weren't thirty people there that afternoon, and he sang his heart out. He convinced me to get my Wobblie card, and I became a member of the IWW. (It might be time for me to re-up.) He was as close to Woody Guthrie as we got in my lifetime--a vagabonding troubadour and labor organizer. He was a treasure that not very many people knew about. Mike in Worcester and Joe in Sunrise wrote me today about Utah, Joe reminding me how he toured a lot with Rosalie Sorrels. Here's a look at Utah trough the years. [youtube=http://www.youtube.com/watch?v=mSZcK48cTiU]Joni Mitchell and The Band. "Coyote." [youtube=http://www.youtube.com/watch?v=OO3ZMdcL8Pc]Little Feat with Bonnie Raitt, Emmy Lou Harris and Jesse Winchester. Dixie Chicken. [youtube=http://www.youtube.com/watch?v=EKNvjgK6-3w] Got to see the Blind Boys of Alabama on Sunday along with Mavis Staples. If the Blind Boys come your way, don't miss the show! Cindy says Louis Prima is the go-to guy for happiness. With Keely Smith and Sam Butera and the Witnesses.